Welcome to the Constitutional Appointments Authority Website. This website is intended as a forum to create awareness of the Authority known as the CAA and to receive feedback about its services. The CAA is a Constitutional body established under Articles 139 and 140 of the Constitution of the Republic of Seychelles whose mandate is to recommend senior judicial officers and other constitutional appointees for appointment by the President as prescribed in the Constitution or an Act and regulate their conduct. 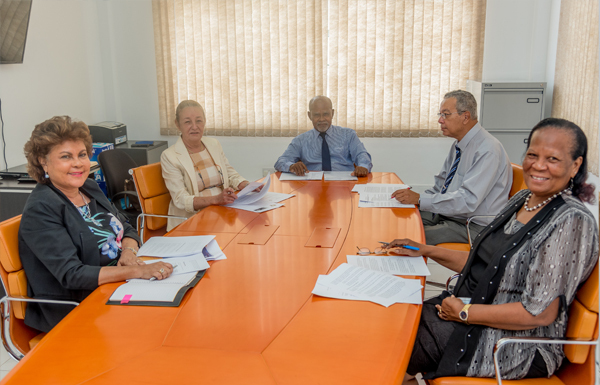 The CAA is composed of 5 members with the mandate to facilitate, improve the efficiency and effectiveness of appointment of senior judicial officers and other constitutional appointees. Members of the CAA are drawn from persons of integrity and unquestionable character. This website provides information on the composition, functions and mandate of the CAA. The website is designed as an easy-to-use informative tool which will work towards fulfilling the CAA’s Vision. - Establish and ensure proper application of the established rules of procedures to handle complaints and deal with them fairly. What is the Constitutional Appointments Authority? This is an Authority established by Articles 139 and 140 of the Constitution of the Republic of Seychelles. It is an independent Authority not subject to the control or direction of any person or authority in the performance of its duties. How can the Constitutional Appointments Authority help you? Receives and assess your complaints of inability to perform their duties or misbehavior against constitutional appointments recommended by the Authority as prescribed in the Constitution or an Act. If your complaint is found outside the scope of the Authority, it shall be rejected and you will be notified in writing. The Authority will however direct you to where you can best be served. Your complaint must clearly indicate your address or physical location so that you can be contacted easily. Can I call the Office to know whether I will be called for an interview? When should I submit an application for a post? Whenever a post is advertised, the closing date and time is clearly specified on the advertisement. No late applications are considered. Can foreigners apply for posts advertised? Unless, otherwise specified, posts are opened to Seychellois Nationals only.